Initiated by Historian Carter G. Woodson in 1915, National African American History Month, also known as Black History Month, marks a time to celebrate and reflect upon the role that African Americans have played in shaping the course of our country's history. The compelling account of physical places that are important in African American history certainly includes Washington, D.C., and the U.S. Capitol Building in particular. One doesn't have to navigate deep into the Capitol Visitor Center (CVC) to find the Slave Labor Commemorative Marker, a solemn reminder of the role that slave labor played in the Capitol's construction. The craftsmanship, done by laborers who lacked the luxury of modern tools, is what stands out most to Prophet "PJ" Jones, an Administrative Operations Assistant in the Architect of the Capitol (AOC) Office Services Division. An avid collector of African American memorabilia, Jones views Black History Month as a time to educate people on the positive impacts that African American culture has had on our country's history and reflect on one's own contributions. "We need to focus more on our national history. I wish all young African Americans understand the importance of Black History Month," Jones said. 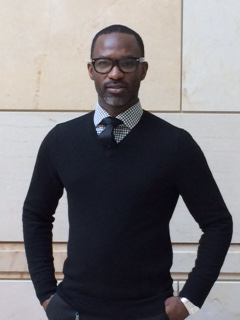 Edward Kessie, Project Architect at the Library Buildings and Grounds, believes Black History Month is a time to learn of the many untold stories of extraordinary individuals of color. He cites Philip Reid, who assisted with the casting of the Statue of Freedom at a time when he himself was not a free man. "Contributions from men like Philip Reid were very instrumental in the development of our country and the Statue of Freedom is a reminder to the nation of their achievements," said Kessie. Kessie pictured with the plaster mold of the Statue of Freedom. The sculptor who assembled the mold would not reveal the secret to disassemble it without a pay increase, "it was Reid who stepped in and solved the mystery." 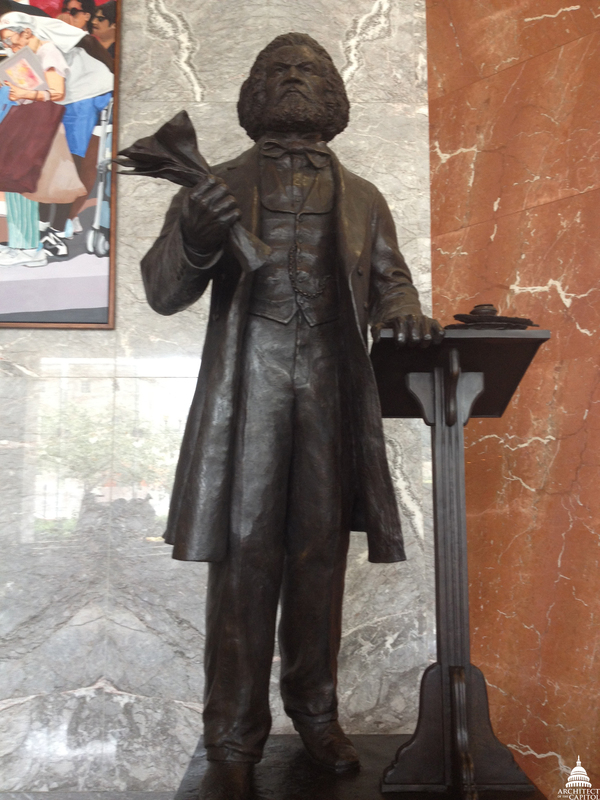 For CVC Public Programs Coordinator Andrea Lewis, the Frederick Douglass statue in Emancipation Hall exemplifies the impact African Americans have had on our country. Lewis, the creator of the Extraordinary Ordinary People: Freedom Fighters in the Capitol Collections tour, admires that Douglass took on the role of freedom fighter for a number of important causes. "African Americans represent one chapter of our history. I want people to know how Frederick Douglass affected your life and the lives of all Americans," she said. 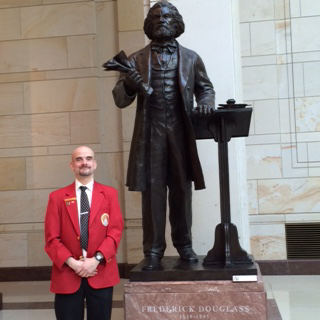 Frederick Douglass viewed the Constitution as an inheritance bestowed upon future generations. Lewis asks, "What are you going to do with your inheritance?" David Linn is one of eight CVC tour guides with the pleasure of performing the Extraordinary Ordinary People tour, which includes reciting part of Douglass' 1852 speech in front of the Rochester Anti-Slavery Society. Linn appreciates that sculptor Steven Weitzman intended for the first full-length statue of an African American in the Capitol to stand out from the other statues. "To me, the statue represents a reflection on our past and a reminder of what still needs to be achieved," Linn said. Linn recites a section of Douglass' historic anti-slavery speech in front of the statue of the abolitionist. 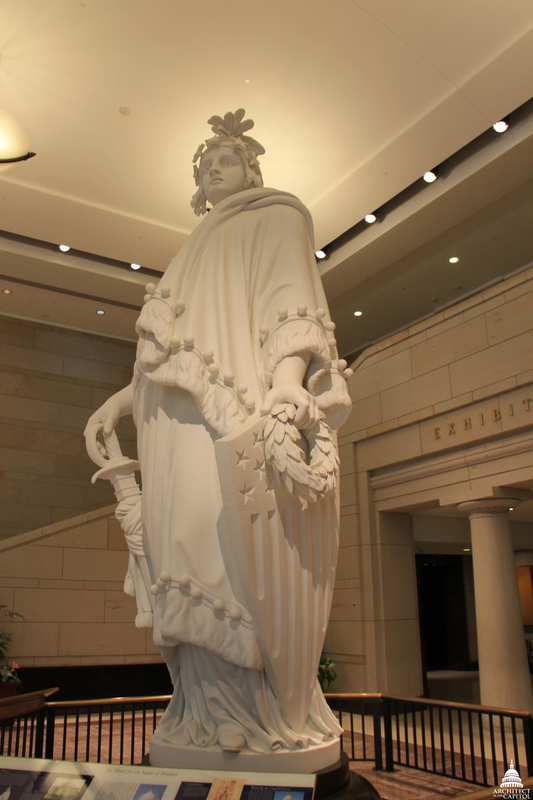 All around the Capitol campus, members of Congress, employees and visitors encounter artistic reminders of profound courage and tremendous sacrifice. From the Sojourner Truth bust to the Emmett Till memorial tree, the Architect of the Capitol is proud of our role in caring for and preserving these tributes.